Originally pitched as the rival to the iPad, early sales of the Xoom were disappointing. As trade began to pick up, along came iPad-2 and knocked the Xoom back again. But Motorola pushes on, an established name in mobile technology. Is the Xoom the device to further Motorola's reputation? The Xoom was the first Android 3.0 tablet and the first to take the upgrade to Android 3.1 - 'Honeycomb,' which is the answer for Android tablets; what is lacking is the saturation of apps designed for Honeycomb as the iPad is wiping the floor with everyone else in terms of numbers of apps built to a single iPad specification and not upsized from a phone OS. 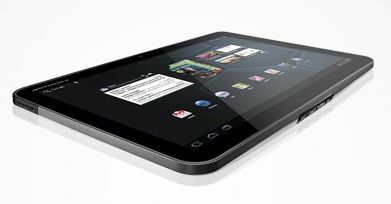 It is price and the state of the Android apps market that is holding back Android tablets and the Xoom in particular. Motorola just doesn't carry the price-premium of the Apple logo, so despite being more bang-per-buck than iPad at similar price-points, it struggles. Which is a shame because the Xoom is a good piece of kit. The Xoom is a bulkier and weightier than many other tablets; the all-black case feels that much sturdier than most of the competition including iPad, although somehow the Xoom has a thinner bezel. It is the heaviest at 730g compared to iPad's 680g and Samsung's 600g Tab. The 10.1 inch screen adopts a wide-screen ratio specifically to be used in landscape orientation. At 1280×800 pixels, this is a good, tablet resolution; ostensibly better than the iPad at only 1024x768 pixels, although that uses an in-plane switching (IPS) display that's better for wide-angle viewing. Viewing angles on the Xoom are rather limited. Gestures on the touch-screen are recognised quickly and accurately. A few games appear to run smoothly, but since I'm no gamer, that proves little. It is good for reading books, that Motorola pushes this in the Google Books app which features a snappy page flipping animation. Try this in portrait mode, though and the aspect ratio is a little odd. The biggest issue with the screen? Although the screen is bright and sharp, it also has a reflective finish, so the image disappears outdoors on even a moderately sunny day. Contrast varies hugely according to lighting conditions. Add to that the typical tablet tendency to retain greasy fingerprints and other grime. Picking it up, the design is a little non-descript and it’s quite heavy. There are no physical buttons on the front since Android 3.x doesn’t need them. Along the bottom edge is a collection of ports and connectors including an HDMI-out port for connecting to a TV. Surprise, surprise, it take a proprietary cable. On the left side are the volume up-down controls. If you get a cheaper case, these can be (translation: ARE) partially obstructed. The power button is mystifyingly on the back of the device next to the camera lens. The speakers are also mounted in the back of the Xoom. There's no distortion, but they're often not loud enough. Put it flat on a surface or in a wrap-around care and everything goes muffled, not surprisingly. The 5-mega-pixel front camera is average at best, producing disappointing quality for stills, which is a shame, since the camera app itself is good, menus let you set picture quality, mega-pixel size, and even make fine adjustments to the exposure level. It shoots adequate video, but with a definite 'wobble-cam' feel in high-def since there's no image stabilisation and it is hard to keep steady. Don't ditch your camcorder, yet. The video editing app, Movie Studio, which imports videos quickly and edits using a traditional 'scrub' interface really stretches the Xoom hardware, occasionally pausing mid-scrub to page through the video file. A basic editor, it is no iMovie. The 2-mega-pixel rear-facing camera is good for video-conferencing but that's all. The Xoom will play just about anything; AAC and MP3 - even at high bit-rates - MPEG4 videos, H.263 and H.264; and it doesn't seem to care where from or how encoded. It will play 1080p content without stuttering. The dual-core processor using 1GB of RAM provides a fast and responsive performance. Having 32GB of local storage and more SD storage supported in Android 3.1 now, the claimed 10-hours of battery life can be achieved with judicious use of media,apps and 3G, but 8.5 is more like it in the real world, less if you hammer it. 4G support is promised with another software update. Android 3.x may confuse Android 2.x smart-phone users for a time. On-screen, you get three persistent (mostly) on-screen buttons in the bottom-left corner for the Back, Menu and Home functions. Notifications rise from the bottom of the screen rather than the top. You get plenty of widgets on screen which under Android 3.x could be much smarter than the 2.x equivalents, but developers are only now getting used to the extra capabilities. The Xoom is as close to instant-on as anyone has yet delivered; from a sleep state to a working home screen is a matter of seconds. There's a stack of preloaded Google apps, including very capable version of a Chrome-derived web browser; fast, accurate rendering of complex pages make it feel like a full-spec laptop or desktop browser, plus it can open multiple tabs and play Flash media. YouTube and the media player work well in full-screen without stutters. Trouble is, you can only set one tab as the default home page and not multiple tabs. Some, but not all apps rotate to portrait. The On-screen keyboard is better than anything on 2.x, possibly better than iPad, so the Xoom can do content creation as well as consumption. 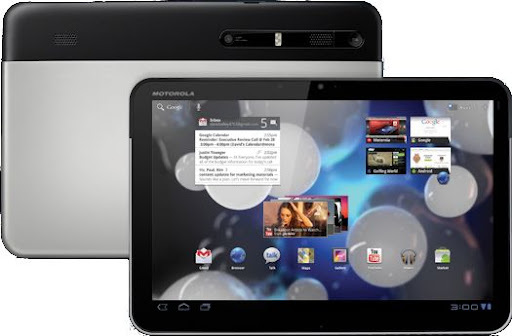 The Motorola Xoom sits between the Samsung Galaxy Tab and the iPad for quality and performance. It's supposedly priced to match the competition, but it looks expensive unless you know what a Tegra dual-core CPU and 10.1 inch screen means. The main issue with this tablet is Motorola. Software updates are slow arriving. Then there's an odd design flaw; you can't charge the Xoom via USB; no one knows how Motorola missed such a vital function when it implemented this in phones before most other producers. Wherever you are, make sure you can find your AC adapter and a socket to beg or otherwise acquire some electricity. How much? It always comes down to this. The Xoom I played with was purchased earlier in the year on 24-month contract with 3 Mobile Broadband (1GB/month), 0 mins, 100 texts, handset £359.99, for £18.20/month plus calls.